To enable soft x-ray microscopy for everyday use without waiting times due to limited beam time at large-scale facilities, lab-scale sources based on gas discharge  or laser-produced plasmas  have been employed. Especially laser-produced plasmas have already been applied successfully in various fields, ranging from material ablation and structuring [6,7] to absorption spectroscopy  and transmission x-ray microscopy [9-11]. Here, the most compact soft x-ray microscope is presented operating in the “water window” region with monochromatic radiation from Helike nitrogen at a wavelength of 2.88 nm. It makes use of a nearly debris-free, long-term stable laser-induced plasma source based on a pulsed gas jet. The setup of the table-top soft x-ray microscope is depicted in Figure 1. It consists basically of a laser-induced plasma source, an ellipsoidal condenser mirror, a Fresnel zone plate objective, and a back-illuminated CCD camera sensitive for soft x-ray radiation. Due to the high absorption cross-section of soft x-rays in air, the experiments are performed in a vacuum system with a base pressure of 1*10-6 mbar. The laser-induced plasma source has been described in detail elsewhere . It is based on a gas target and a Nd:YAG laser system (Quantel, wavelength 1064 nm, pulse energy 600 mJ, pulse duration 10 ns, repetition rate 5 Hz). The radiation emitted from the nitrogen plasma is filtered by a titanium (Ti) filter (thickness 200 nm) to block out-of-band radiation, such as visible light or scattered laser radiation. Furthermore, radiation below the Ti L-edge (λ = 2.7 nm) is also absorbed, ensuring monochromatic irradiation of samples at λ = 2.88 nm wavelength. The spatial distribution of the plasma is monitored by a pinhole camera (pinhole diameter 50 µm); the nitrogen plasma size at λ = 2.88 nm is measured to be 0.44*0.24 mm² (FWHM). To assess the imaging performance of the soft x-ray microscope over the full field of view (FOV ≈ 50 µm), initially a Siemens star test pattern was recorded (NTTAT, model ATN/XRESO-50). The corresponding micrograph (see Fig. 2) indicates an almost uniform illumination over the full FOV. As seen from the inset of Figure 2, the smallest structures of the Siemens star having a size of 50 nm are well resolved in all directions. Further, the polyextremophilic bacterium Deinococcus radiodurans was imaged (see Fig. 3): the representative structure of the bacterium is clearly evident. Other iron enriched micro-organisms were additionally investigated. Due to their iron content they show a stronger absorption compared to carbon containing material. Geo-colloids collected from a water sample (river Main/central Germany) were examined, showing microstructured as well as irregular particles. The necklacelike structure visible in the lower part of the micrograph is supposed to stem from biological debris material. 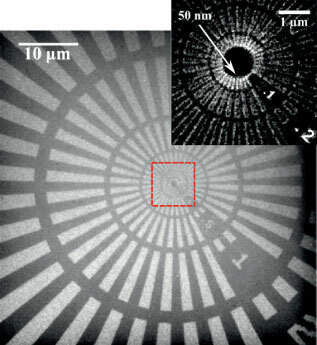 The spacing of the regularly arranged isolated “holes” is approximately 215 nm, indicating the high resolution capacity of the table-top soft x-ray microscope. We have demonstrated the feasibility of a table-top soft x-ray microscope operating at a wavelength of 2.88 nm. It is based on an almost debris-free, longterm stable laser plasma produced in a gaseous target. Currently, structures of about 50 nm in size are already detectable, among other factors limited by the low signal-to-noise ratio due to the relatively low brilliance of the plasma. However, the presented system offers various opportunities for the scalability of the photon flux, which has already been separately investigated in the past. First of all, lasers of higher repetition rate (average power) and / or shorter pulses can be employed. Due to the higher degree of excitation the use of ps laser pulses of the same energy as the currently employed ns pulses can boost the brightness of the plasma by more than a factor of 10 in the “water window” range . Moreover, higher particle densities by use of either higher gas pressures or the barrel shock approach can increase the brilliance of the laser plasma by at least one order of magnitude . Such improvements will be incorporated into the system in the future to reduce exposure times for recording of micrographs, thereby maintaining the compactness of the microscope and especially the inherent cleanliness of the soft x-ray source. Financial support by the “Deutsche Forschungsgemeinschaft” within “Sonderforschungsbereich 755” “Nanoscale Photonic Imaging” (Project C04) is gratefully acknowledged. The authors like to thank T. Salditt and J. Niemeyer (both Univ. Göttingen) for stimulating discussions. W. Meyer-Ilse, D. Hamamoto, A. Nair, S. A. Lelièvre, G. Denbeaux, L. Johnson, A. L. Pearson, D. Yager, M. A. Legros, and C. A. Larabell, J. Microsc. 201, 395–403 (2001). M. Juenger, V. Lamour, P. Monteiro, E. Gartner, and G. Denbeaux, J. Mater. Sci. Lett. 22, 1335-1337 (2003). W. Chao, P. Fischer, T. Tyliszczak, S. Rekawa, E. Anderson, and P. Naulleau, Opt. Express 20, 9777–9783 (2012). M. Benk, K. Bergmann, D. Schäfer, and T. Wilhein, Opt. Lett. 33, 2359-2361 (2008). M. Berglund, L. Rymell, M. Peuker, T. Wilhein, and H. Hertz, J. Microsc. 197, 268-273 (2000). F. Barkusky, C. Peth, A. Bayer, and K. Mann, J. Appl. Phys. 101, 124908 (2007). A. Bartnik, H. Fiedorowicz, R. Jarocki, J. Kostecki, A. Szczurek, and M. Szczurek, Appl. Phys. B 96, 727-730 (2009). C. Peth, F. Barkusky, and K. Mann, J. Phys. D: Appl. Phys. 41, 105202-105207 (2008). M. Müller, T. Mey, J. Niemeyer, and K. Mann, Opt. Express 22, 23489-23495 (2014). P. Wachulak, A. Torrisi, A. Bartnik, D. Adjei, J. Kostecki, L. Wegrzynski, R. Jarocki, M. Szczurek, H. Fiedorowicz, Appl. Phys. B 118, 573-578 (2015). M. Müller, T. Mey, J. Niemeyer, M. Lorenz, and K. Mann, AIP Conf. Proc. 1764, 030003 (2016). S. Kranzusch and K. Mann, Opt. Commun. 200, 223-230 (2001). M. Müller, F. Kühl, P. Großmann, P. Vrba, and K. Mann, Opt. Express 21, 12831-12842 (2013). T. Mey, M. Rein, P. Großmann, and K. Mann, N. J. Phys. 14, 073045 (2012).